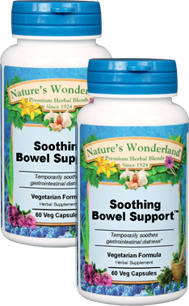 Soothing Bowel Support™ - 550 mg, 60 Vcaps™ each (Nature's Wonderland) - Penn Herb Co. Ltd.
Is your intestinal system making you a prisoner to the restroom? Many have digestive systems that are troubled by occasional diarrhea, upset stomach and digestive discomforts. Enjoy newfound confidence and comfort with Soothing Bowel Support™. As an addition to the daily diet, take 1 or 2 capsules 3 times daily with water at mealtimes. NOT TO BE USED DURING PREGNANCY.